BLONDIE TAKE INSPIRATION FROM THE BLEND?! World famous band Blondie seem to have been so impressed by The Blend‘s video for ‘Don’t Waste My Time’. This song is a debut single of the Brit rock band which was taken from their debut album ‘All Departures’, and it was released in August 2016 along with the music video. A few months ago, The Blend guitarist and front man Dylan Smith shared the video with counterpart Chris Stein of Blondie. Recently I found that Blondie‘s brand new video for ‘Doom or Destiny’ which was released on 7th December has a lot of similarities to ‘Don’t Waste My Time’. It is great to see these boys are having an influence on the global music scene. So I have decided to ask Dylan a few questions about it. How have you been since last time we talked? I’ve been very good thanks. We’ve been very busy dealing with business, and getting everything together for next year! There’s some exciting things going on, it’s a good time for The Blend. I want to talk about one of your videos today. Is that okay with you? Your band’s video for ‘Don’t Waste My Time’ was released in August last year. A lot of people have watched it! It has been viewed almost 9,000 times! You must be pleased! Yes, it’s a really great video that we worked very hard on! It was our own concept and we created the whole storyboard ourselves! We wanted to make a music video that really commented on what a mess the music industry is in, and how much ‘total junk’ is all over the TV, news, X Factor and all that. A few days ago, legendary band Blondie dropped their new video for ‘Doom or Destiny’. When I watched it, I immediately thought about your video. I thought there were a lot of similarities. You told me that you’ve seen it too! How did you feel when you watched this video? Well firstly, Blondie are one of my absolute favourite bands and always have been. I’ve looked up to them as musicians since I was really young, they’ve really inspired me over the years. I really do admire their attitude as well. But yes, I have seen their new video and it is very similar to ours. 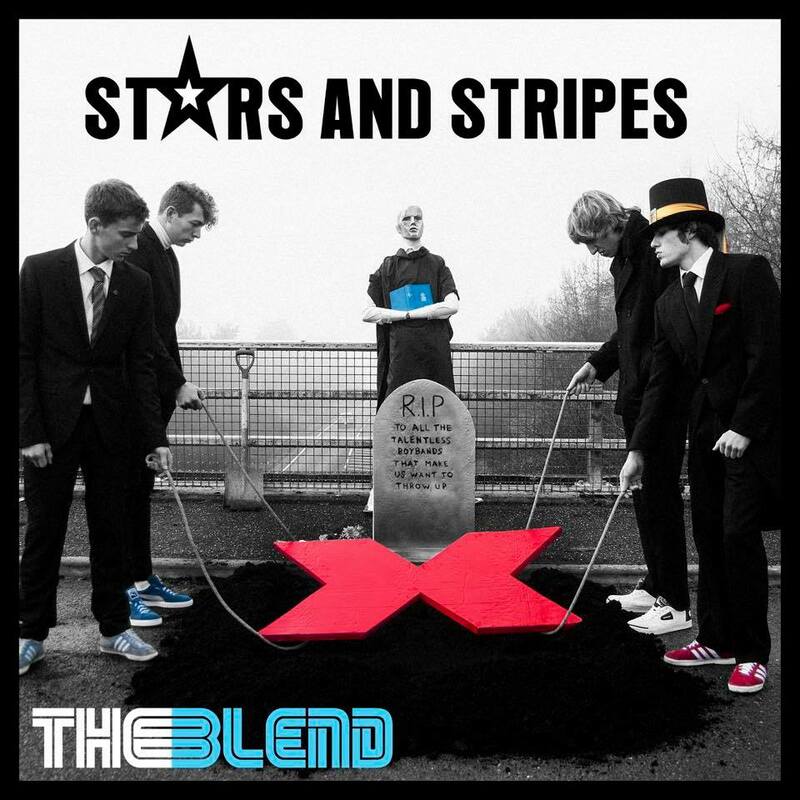 It’s a big thing for me to know Blondie are taking inspiration from The Blend, how cool is that? Debbie Harry and band looking up to us. Although I must say, they are taking the piss a little with the video. Oh well, they’re old and past it now. There’s no way those old fuckers can walk on stage and smash the line like we can! You mentioned that you’ve shared your video with their guitarist Chris Stein. How come you wanted to share it with him? Well, I shared the ‘Don’t Waste My Time’ video with Chris a few months ago, and it was because he is one of my guitar hero’s. I went to him asking for his support and opinion on what we are composing… I guess he must have loved our songs and video that much, that he wanted Blondie to do something very similar. It’s great to know a band as big as Blondie are taking inspiration from The Blend. A band I’ve looked up to all my life, are now looking up to me. Things would happen even you didn’t expect it! Do you have anything to say to Blondie about their video? It’s a good effort, but it’s not as good as ours guys. On another subject, you have been recording at the boat studio. This sounds already interesting, but involving another famous artist is even more. Could you tell me about it? Yes! We’ve been recording some mega new tracks on Pete Townshend’s boat. I’m really enjoying working on these records more than anything we’ve done before. Pete’s place is such a great studio and I feel really relaxed and at home when recording there. The tracks are the best songs we’ve ever made as a band, we know they are going to be massive!! I can’t wait to get them out there and put all these X Factor idiots in their place. It sounds really exciting! You must be very excited too about the forthcoming release! So, what is coming from The Blend next? Like I said, some absolute mind blowing new records!! We’ve got the biggest gig of our career so far next year, look forward to announcing that one. Also a very very cool music video directed by my lovely friend Carol Harrison, we’re keeping that one on the down low for now. Super! Is there anything else you would like to say? How many scenes of similarities can you spot?